Piping Technology & Products, Inc. engineered, designed and built this 5’ x 22’ stainless steel, thick wall, tied, universal expansion joint for a major producer of agricultural chemicals in Louisiana. 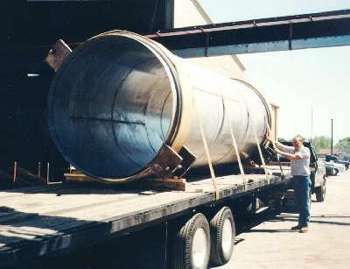 A special in-house CAD program was utilized in the design effort for these expansion bellows to meet the process parameters. Also, special guides and anchors were provided to facilitate proper operation of this critical unit within the system.